At the heart of the Mary White experience is the opportunity to make lifelong friends from our diverse community. There is sure to be someone else that shares your interests and outlook on life as well as many others that will expand your horizons with a different view on the world. 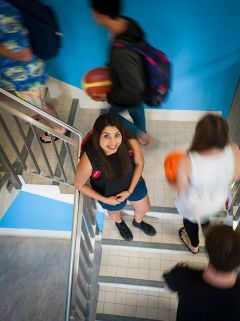 To help break the ice and build friendships, there are organised social events throughout the year starting in O-week, prior to the start of lectures. Weekend BBQ lunches and themed dance parties provide the chance to relax, socialise, and take a break from your studies. The College Ball, an annual event, is an opportunity to have fun and celebrate the Mary White community. 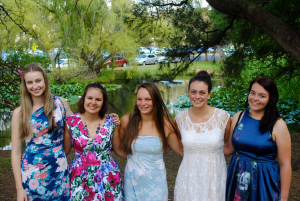 Most social events are organised by the Junior Common Room (JCR) student club; they're held either at College or at venues in Armidale. Formal dinners are held regularly throughout the year to celebrate key events within the college calendar and to recognise academic, community or sporting success. Mary White is also only a short walk to the 'Stro, UNE's on-campus bar and entertainment venue, which opens every Thursday night. 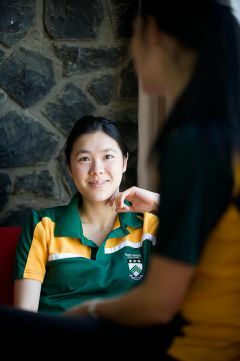 Mary White College has representative teams in local town competitions as well as a number of social sporting competitions within the University and Armidale. 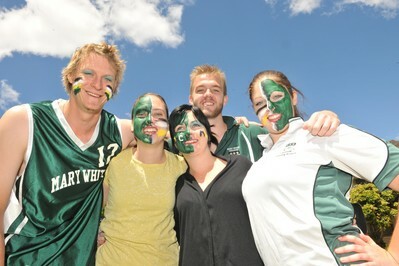 Residents of Mary White regularly represent the University in the National University Games. The individual and team sports we play are both single- and mixed-gender. Sports include: soccer, hockey, netball, volleyball, water polo, badminton, swimming, rugby union, AFL, touch football, cross-country, athletics, rock climbing, relay, tennis, basketball, ultimate frisbee, lawn bowls, golf, scuba and squash. Most of the sports in which we participate are held at the University's sport facilities — just a 5 minute walk from Mary White. This facility is recognised as one of Australia's premier University sporting precincts and provides a variety of fitness classes, indoor courts, outside fields, an accredited gymnasium with instructors, and a heated swimming pool. Student discounts are available. Mary White College a long-standing tradition of inter-college sporting participation including the annual Mary Bagnall Trophy competition for women and the President's Trophy competition for men. Mary White has a strong tradition of celebrating the diverse talents of our residents. While you may not feel so comfortable on the sporting field, maybe your chance to shine is behind a microphone or musical instrument. The College has a baby grand piano, one standard piano, a drum kit as well as a sound system. One can often hear a tune being played on the spur of the moment or as part of practice or rehearsals for some of our special events such as a formal dinner. Mary White is committed to a variety of community engagement activities and recognises the importance of corporate, social and environmental responsibility. Each year we nominate a charitable foundation for whom we conduct fundraising activities throughout that year. Our previous projects have raised for organisations such as Canteen, Beyond Blue, Armidale Women's Refuge, Salvation Army, the Leukemia Foundation and Shave for a Cure. Our students also attend historic Saumarez Homestead each year for a gardening and maintenance day where we help keep the heritage establishment in good condition. 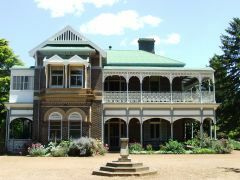 Saumarez Homestead was the home of Miss Mary White, in whose honour the College is named. The College is committed to sustainability with an active in-house recycling program and commitment to regular events such as Earth Hour. Our recently renovated buildings are designed with energy efficiency and water saving in mind. These new blocks contain double-glazed windows for heat insulation, and movement sensitive lighting. Approaching each exam period, a noise curfew is put in place to ensure that an ideal study environment is provided for students to study effectively. The annual Commencement Dinner celebrates the academic achievements of Duval College students. High achievers in each university year are rewarded for their academic effort and success. The College honours academic excellence in a visible way. Awards for Highly Commended Academic Achievement (Silver) and for High Academic Achievement (Gold) are displayed on the Honour Boards in the College dining hall. Along with this public recognition, the silver award for achieving a Credit average and gold award for Distinction average or higher, offer monetary reward as well, donated by the Duval College Senior Common Room. A foundation stone of the academic support program Mary White College is the Academic Mentor team. The Senior Academic Mentor and Academic Mentors from various disciplines at UNE are students who have consistently achieved high academic success. The College academic mentors undertake training in academic skills such as essay writing techniques, tackling plagiarism, communication and organisational skills. The Senior Common Room is a group that meets every month to provide a link between students, faculty support, and the community. The SCR discusses and plans ongoing mentoring and activities for all students. The Senior Resident Fellow (SRF) is primarily responsible for helping the Head of College in Residential College pastoral care. This role involves working closely with the Resident Fellow and Academic Mentor teams to ensure the best pastoral care possible is on offer to residents. Supporting the SRF are seven appointed Resident Fellows undertaking two main functions. Firstly, a Resident Fellow is allocated to one of the blocks and is responsible for the cultural, social and sporting well-being of the members of their areas. Out of College Office hours the Resident Fellow is also responsible for the security of the residents and the College premises and to see that social activities do not disturb other residents. The RFs also have individual portfolios covering key aspects of college life. At all times a Duty Resident Fellow is rostered on to deal with the running of College outside normal office hours. The Duty Resident Fellow is your help in an emergency (all are First Aid trained. If you have locked yourself out of your room or if you need any other immediate practical assistance.